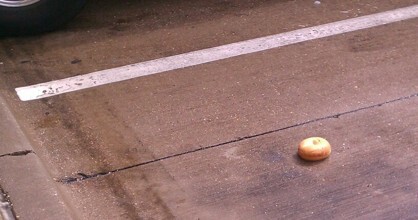 I was making my usual morning trek to Starbucks, where I like to sit and write while enjoying a low-fat vanilla latte. My mind was blank as I drove down the all too familiar roads—I guess you could say I was operating on autopilot. Just as I was pulling into the parking lot, I surprised myself by saying out loud, “This isn’t where I want to be.“ I found myself steering the car to The Good Shepherd Catholic Church which was just a few blocks away. This was completely out of character for me since I haven’t been a practicing Catholic for over 25 years. For various reasons, I stopped going to Mass when I went away to college. I considered myself more spiritual than religious. In fact, I often referred to myself as a Spiritual Mutt since I was attracted to elements of several different religions, yet didn’t formally practice any of them. I have always believed in my heart that we are all praying to the same God, we just have different roads leading us to Him. But today the road was undeniably leading back to my Catholic upbringing. The main church was locked, but I discovered a small side chapel that was open. Inside, it was completely quiet and very, very charming. There was only one other soul there besides me, and she was quietly praying the rosary, oblivious to my presence. I sat down and started flipping through the pages of the church missal to see if I even remembered the flow of the Mass. I was surprised at how easily it all came back to me. I also noticed that a few of the words and responses had changed. You know you have been away from the Catholic church for a long time when the Vatican has made tweaks to the Mass during your absence! As I was re-familiarizing myself with the Catholic church, I noticed that several other ladies had entered the little Chapel. About 5 minutes later, the church bells began ringing, announcing the noon hour. It was unexpected and beautiful. Almost immediately the women stood up and began praying aloud. Not wanting to stick out like a sore thumb, I popped up too and joined them as best I could. When they finished, music began softly playing through the speakers. Just one beautiful, instrumental song and then silence. It sounded familiar, but I couldn’t quite place it. I paused for a few moments and then stood to leave. I attempted to genuflect and quickly realized how out of shape I am when I had to struggle to get upright again. It was just one more reminder of how long it’s been since I’ve been to church. Kneeling and genuflecting was not this difficult or painful when I was a child. On my way out, I quietly approached one of the women and asked what the noon prayer was called. She smiled and said it was The Angelus. Sitting back in my car, I had to look up The Angelus on my iPhone. It was worth a Google. Turns out, it’s a Catholic prayer to Mary honoring the Incarnation. It is traditionally recited at 6am, noon and 6pm. 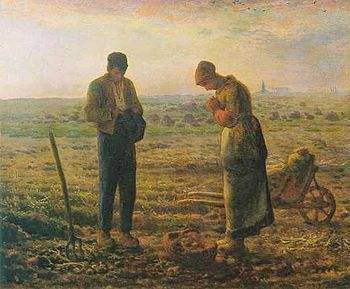 French painter Jean-Francois Millet’s famous painting bears the same title. It features two peasants pausing in a field during sundown to say The Angelus. It now resides in The Louvre Museum in Paris. I don’t think it was a coincidence that I was there to experience The Angelus. It felt like it was meant as a gift. I made sure to say thank you. This entry was posted in Confessions, Spirituality and tagged Blessed Mother, Catholic, Church, God, Medjugorje, The Angelus, Wayne Weible on June 17, 2013 by Parking Space Bagel. I'm a self-proclaimed Creative Muse filled with inspiration and oddball observations about this crazy experiment we call life.